While I am a fan of historical fiction, I'm not sure I would have picked up this novel but for its being on the Mock Newbury prerequisite list. Beaufrand's first novel tosses one into the middle of a feud between the Medici and Pazzi families. 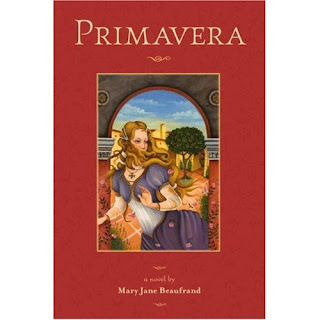 Told from the perspective of the less beautiful (and therefore less valued and forced into partial servitude) younger sister of the Pazzi household, Beaufrand attempts to engage the reader in the intrigues that ran rife throughout the Renaissance. Protangonist Flora is a strange character. Though destined for the convent she has not been sent, for vague reasons involving her grandmother. While my memory of the roles of women in the Italian renaissance is a smidge rusty (it's been seven years since that incredibly awesome college history course), I find it extremly unlikely that any young woman of noble family would have been permitted the freedoms described. Young noblewomen, whether valuable enough to marry off or not, weren't given weapons training. Plot summary: The head of the Pazzi family, Flora's father, seeks power--either through a marriage alliance with the Medici or by murdering the Medici brothers and driving the family from Florence. Despite the manipulations by him and his wife, including having daughter Domenica painted by Botticelli as a Madonna, the marriage contract is not made and the attempted murder is foiled--by Flora. Father and one son are executed, another son permanently imprisoned, Domenica escapes into a convent, mother is exiled, and associates are murdered. And Flora is taken in by a goldsmith, where she learns to work beautiful gold pieces before escaping the country with a former servant. Overall I was disappointed. Even putting aside my skepticism at how freely and openly Flora behaved, things didn't feel realistic. I could believe the scheming and the power plays being carried out by the families but I felt they got buried and confused with side stories of a captain of the guard in love with the older sister, the story of a servant boy who'd had nothing to eat for two days, what the grandmother's role was, and the addition of Botticelli. I was expecting a lot more involvement from the artist or more use of him to advance the story--and instead it felt like a reuse of Leonardo da Vinci's role in Ever After. Following the assassination attempt the story hit a peak with the violence and then game to a grinding halt. Suddenly we advanced four years with very few problems and oh, btw, people have been talking about this "girl dressed as boy apprentice" but no one has done anything about it? That rang entirely unbelievable. We got suggestions of the gold work at the beginning of the book but didn't have a chance to really hear about her development as a gold apprentice. The ending, which finally brought together the title with the storyline, was far too rushed. Despite my rather critical review of it, I understand why it was selected for Mock Newbery and I think it has a good shot for the real Newbery. The writing is good, albeit somewhat dry. There's a healthy dose of history mixed in and it's one of those books I can see adults saying is a "good book for children." Whether or not it will actually go over well with the age group it is intended for remains to be seen.